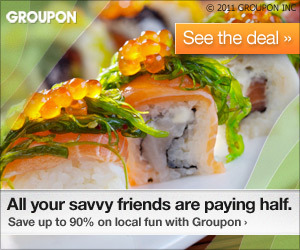 Groupon allows you to save BIG on local activities, eating out and so much more. Each day there is a new and exciting deal local to your area. I have taken advantage of some great deals and you can too! Today my local deal for 55% off and 1,765 people have already purchased it! All you have to do is submit your e-mail address and local zip code to take full advantage of all the great deals. You'll be happy that you did, I promise!